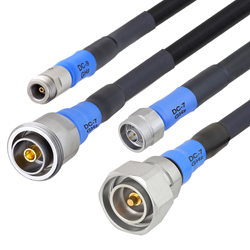 "With 19 different configurations, we offer more off-the-shelf connector and length combinations than any other RF component supplier. Additionally we stock these cables to make sure our customers’ projects stay on schedule,” said Dan Birch, Product Mgr. Pasternack, a leading provider of RF, microwave and millimeter wave products, has launched a new series of handheld, RF analyzer, rugged, phase-stable cable assemblies. Typical applications include field testing, tower measurements, base station analyzers, handheld network analyzers, portable spectrum analyzers, distance-to-fault measurements and site maintenance. Pasternack’s handheld, RF analyzer, rugged, phase-stable cable assemblies are in stock and ready for immediate shipment with no minimum order quantity. For detailed information on these products, please visit https://www.pasternack.com/pages/RF-Microwave-and-Millimeter-Wave-Products/handheld-rf-analyzer-rugged-phase-stable-cable-assemblies.html.